The Great Solar Car Race begins in Australia: Can it save Humankind? 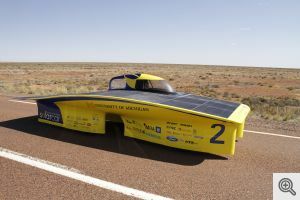 On Sunday, the every-other-year great solar car race (the Bridgestone World Solar Challenge) began in Australia, as vehicles powered by sunlight competed to get from Darwin to Adelaide (3000 km/ 1800 miles) as quickly as possible. An electric car with the right range and speed is crucial to solving the problem of climate change, since exhaust from petroleum-driven vehicles is a significant part of our carbon dioxide emissions. C02 in turn is causing catastrophic climate change. Me, I can’t understand why everyone in the market for a new car and who can afford one doesn’t buy a Chevy Volt. It is a dream car; they have dropped the price on it and there is a hefty government rebate. Especially if you put in solar panels on your roof and run it off them, the combined system (panels + EV) quickly pays for itself and quickly reaches the point where the carbon emitted in its construction is surpassed by savings. ANN ARBOR—With a bold, asymmetrical vehicle that’s logged thousands of test miles on two continents, students on the University of Michigan’s top-ranked Solar Car Team say this could be their year for a world championship. U-M’s team—currently No. 1 in the U.S.—will compete against 25 others from across the globe in the Bridgestone World Solar Challenge. The week-long, 1,800-mile trek across the Australian outback begins Oct. 6, which is the afternoon of Oct. 5 in the U.S.
For the past quarter century, the race has happened every other year, and Michigan has finished third five times. The 2013 vehicle, Generation, makes the best of new regulations that require four wheels and a more upright driver. Like a motorcycle with a sidecar, Generation situates the driver on one side, rather than in the middle of the chassis. The design allows for a sleeker underbelly and a more aerodynamic silhouette. 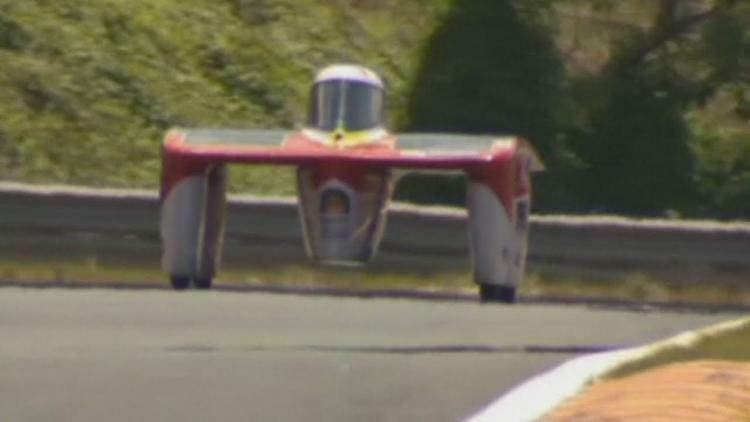 The car weighs less than 600 lbs and has a lithium ion battery and a carbon fiber body. In Generation, the students say they’ve achieved a powerful combination that could best their predecessors’ results. “We’ve come up with what we think is the most optimal design and, in addition, we’ve been able to test it thoroughly. So I think that will give us a huge advantage,” said Eric Hausman, team project manager and senior in industrial and operations engineering. Since unveiling Generation in June, the students have taken it on a 1,000-mile practice race on home soil and a longer one in Australia. It’s been remarkably reliable, Hausman says. A dependable car means less race time spent on the side of the road. In 2011, the team had to stop twice in one day to repair torn wheel fairings while the first- and second-place teams pulled ahead. The students don’t want to comment on their strategy, except to say that they did practice passing other vehicles in case they need to. U-M is one of four teams in the race that have chosen asymmetrical designs. The others include 2011 first- and second-place teams Tokai University from Japan and Nuon from the Netherlands. Drivers will take turns in three- to six-hour shifts. Kyle Chudler, a junior in atmospheric, oceanic and space sciences, described what it’s like at the wheel of Generation. Pick-up isn’t important in this case, though. Endurance is—for the car and its operators. Teams have until Oct. 13 to complete the course, but the winner will likely finish by Oct. 10.